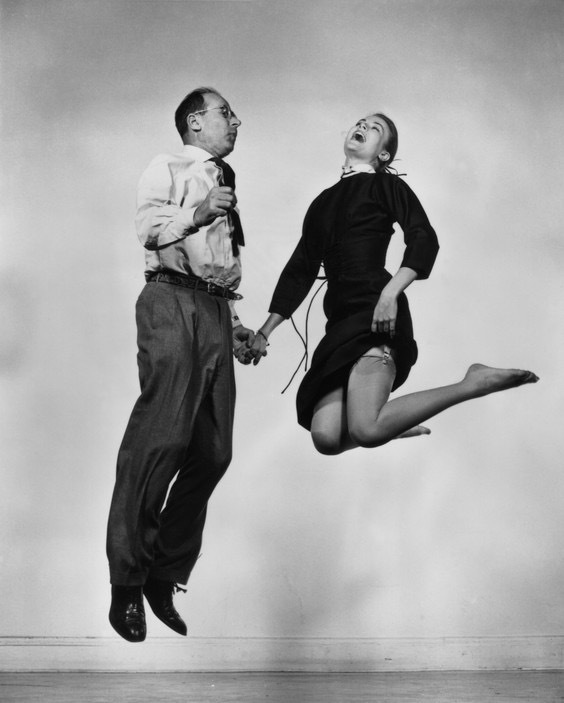 The book: Philippe Halsman’s Jump Book, Publisher: Simon and Schuster, New York, 1959. Philippe Halsman (American, born Latvian; Magnum photographer; 1906–1979) was a preeminent photographer, portraitist, of cultural icons — from Winston Churchill to Marilyn Monroe, Aldous Huxley to Robert Oppenheimer. Life Magazine featured his photos of 20th century leaders and luminaries on their cover a record 101 times. 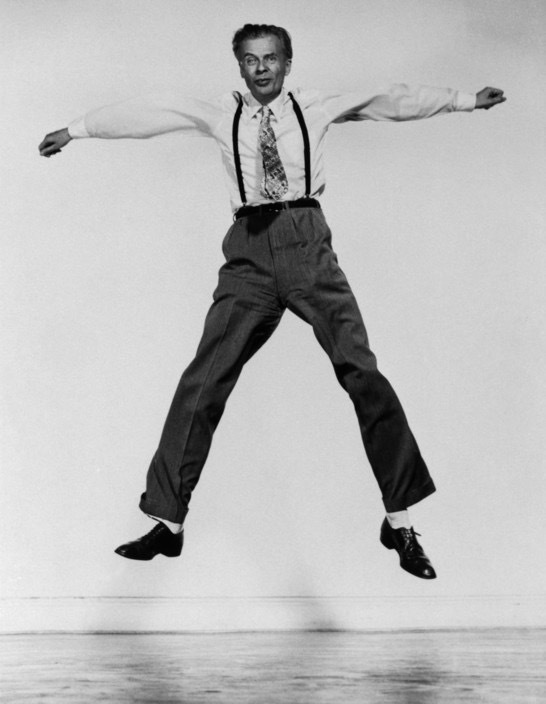 Throughout the late 1940s and 1950s, he adopted a habit, a “hobby” as he called it, of asking his stellar subjects at the end of their portrait session to do something silly, irrational really… to jump. And they did! 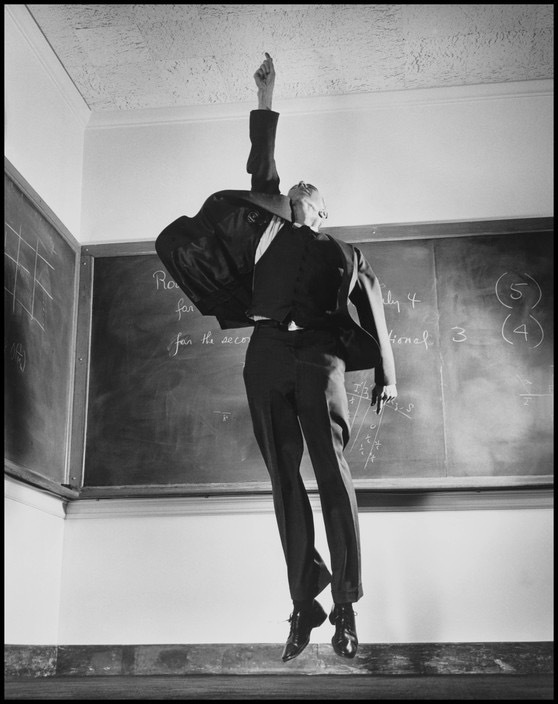 Such was the warmth and persuasive power of Halsman over even the most reserved scientist, politician or monarch. His objective was simple: to capture an unguarded moment of his photographic subject’s carefully crafted and polished public image. 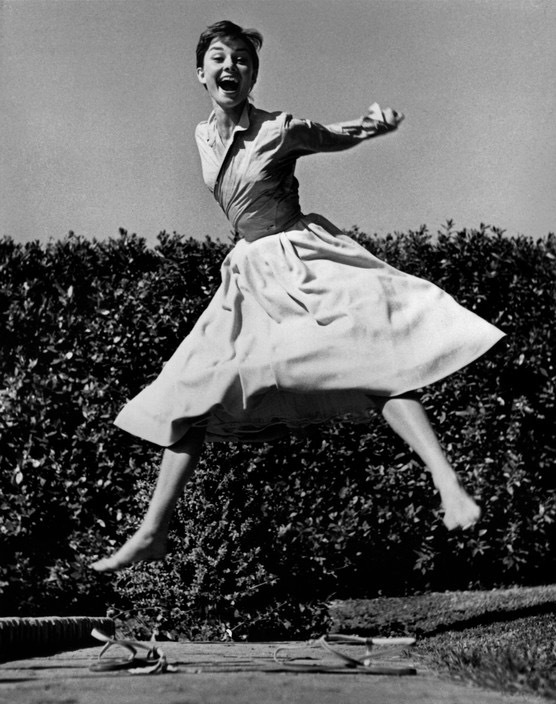 Philippe Halsman (American, 1906–1979): Dutch actress Audrey HEPBURN. 1955. © Philippe Halsman/Magnum Photos. 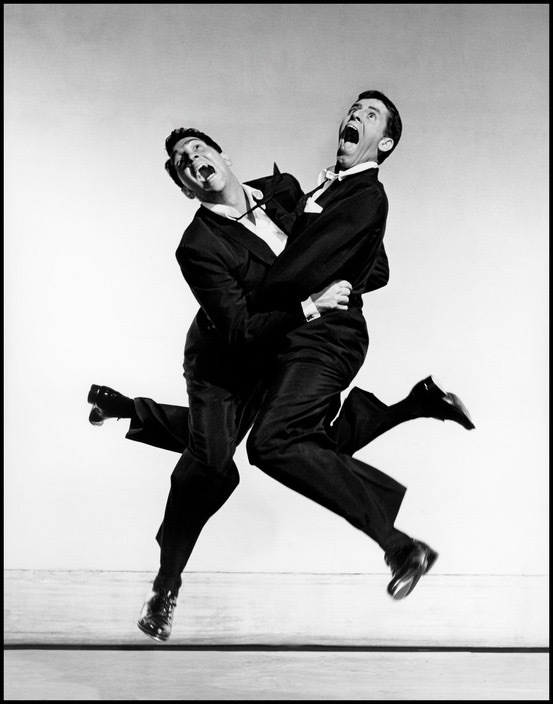 Philippe Halsman (American, 1906–1979): American actors Dean MARTIN and Jerry LEWIS, 1951. © Philippe Halsman/Magnum Photos. 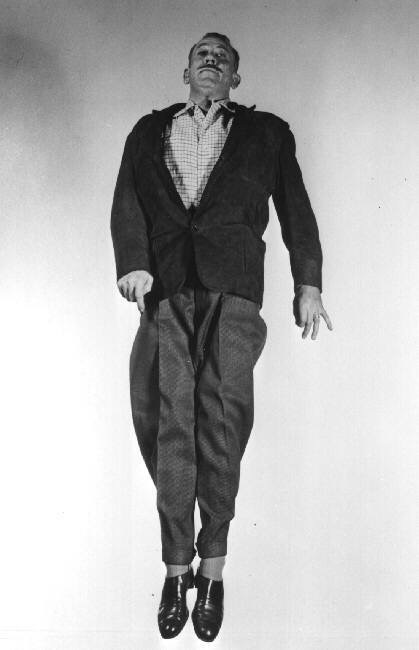 Philippe Halsman (American, 1906–1979): Jackie GLEASON, 1955. © Philippe Halsman/Magnum Photos. Philippe Halsman (American, 1906–1979): writer Aldous HUXLEY, 1958. © Philippe Halsman/Magnum Photos. 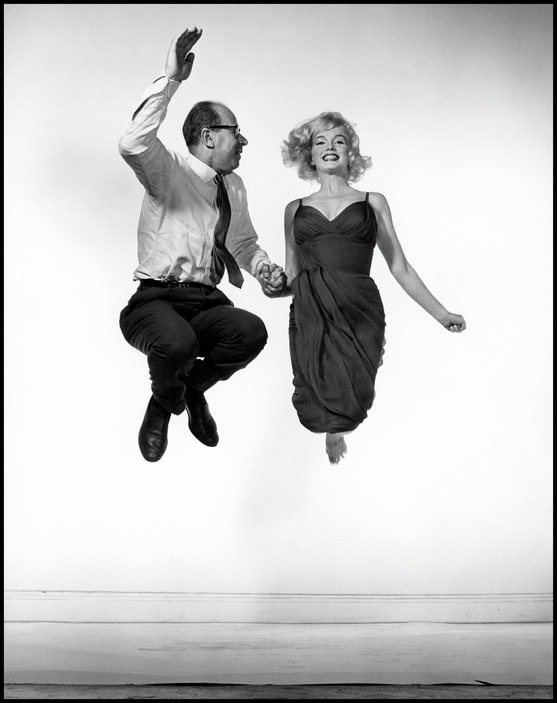 Philippe Halsman (American, 1906–1979): American actress Marilyn MONROE jumping with Philippe HALSMAN, 1959. © Philippe Halsman/Magnum Photos. 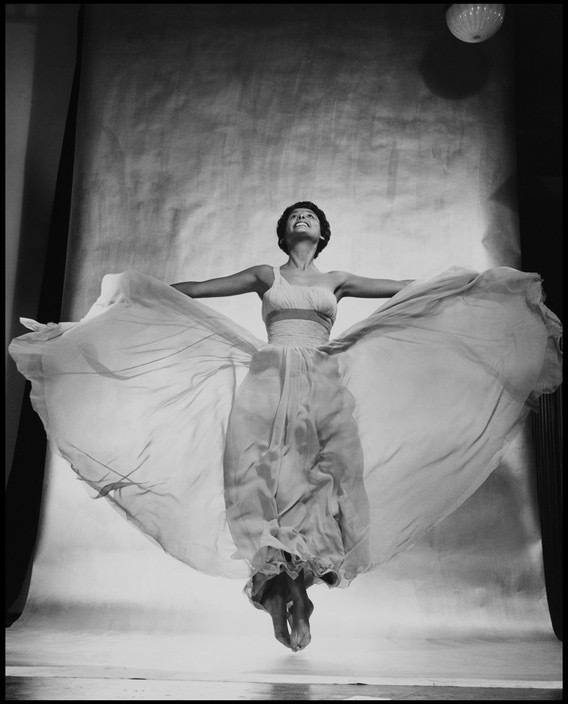 Philippe Halsman (American, 1906–1979): Singer/actress Lena HORNE, 1954. © Philippe Halsman/Magnum Photos. 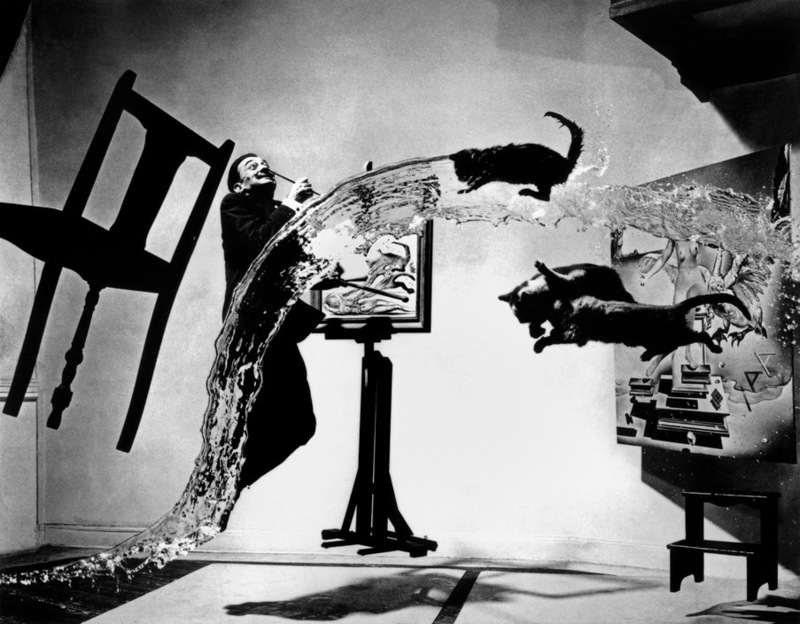 Philippe Halsman (American, 1906–1979): painter Salvador DALI. “Dali Atomicus,” 1948. © Philippe Halsman/Magnum Photos. Philippe Halsman (American, 1906–1979): writer John STEINBECK, 1953. © Philippe Halsman/Magnum Photos. Philippe Halsman (American, 1906–1979): American physicist J. Robert OPPENHEIMER, 1958. © Philippe Halsman/Magnum Photos. 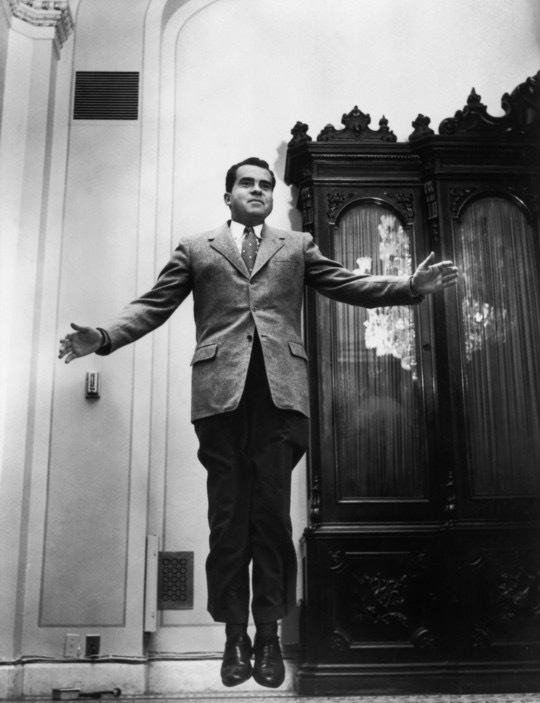 Philippe Halsman (American, 1906–1979): The American Vice President Richard NIXON, 1959. © Philippe Halsman/Magnum Photos. Philippe Halsman (American, 1906–1979): actress Grace KELLY and American photographer Philippe HALSMAN. © Philippe Halsman/Magnum Photos. 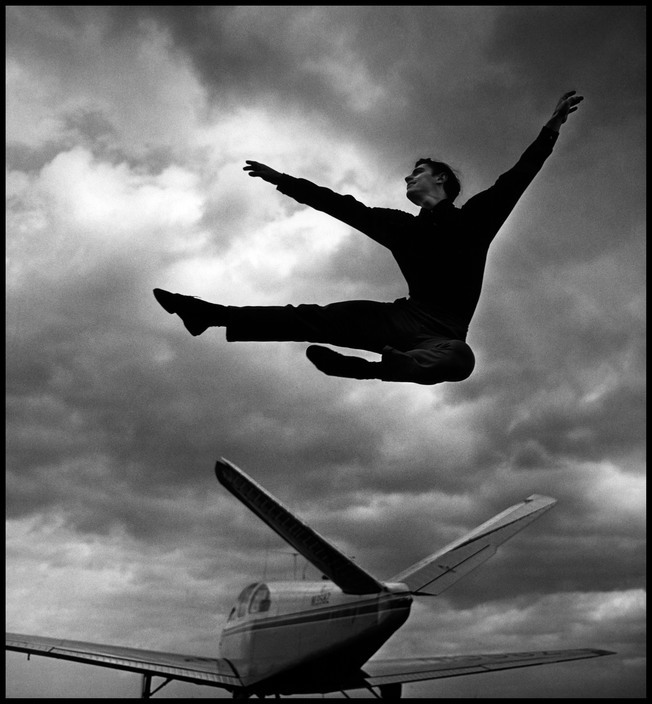 Philippe Halsman (American, 1906–1979): Edward VILLELLA, 1961. © Philippe Halsman/Magnum Photos. 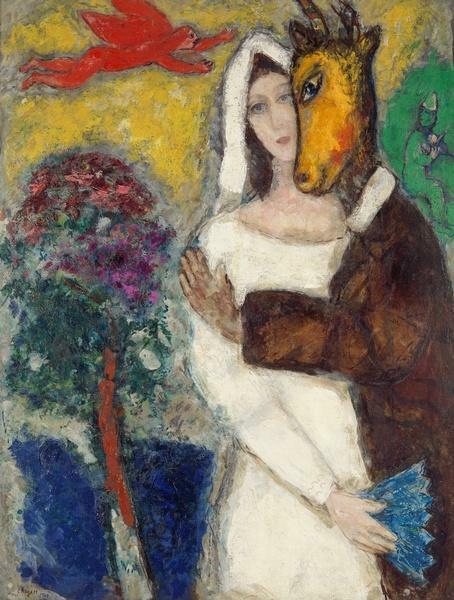 Marc Chagall (French, born Russia — present-day Belarus; 1887-1985): Midsummer Night’s Dream, 1939. Oil on canvas, 116.5 x 67.9 cm. Musée de Grenoble, Grenoble, France. © This artwork may be protected by copyright. It is posted on the site in accordance with fair use principles. 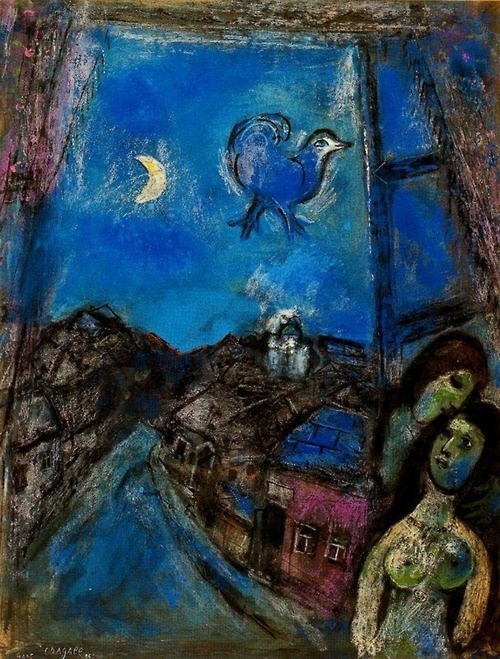 Marc Chagall (French, born Russia — present-day Belarus; 1887-1985): Evening at the Window, 1950. Oil on canvas. Sammlung Rosengart Art Museum, Lucerne, Switzerland. © This artwork may be protected by copyright. It is posted on the site in accordance with fair use principles. 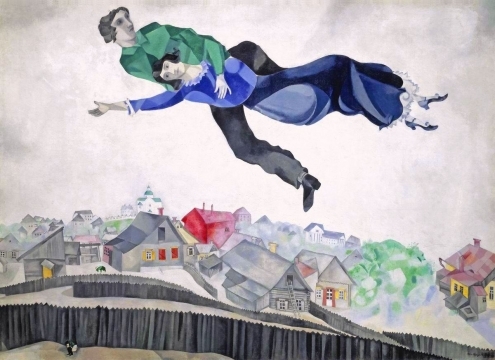 Marc Chagall (French, born Russia — present-day Belarus; 1887-1985): Over the Town, 1918. Oil on canvas, 45 x 56 cm. The State Tretyakov Gallery, Moscow, Russia. © This artwork may be protected by copyright. It is posted on the site in accordance with fair use principles. Marc Chagall (French, born Russia — present-day Belarus; 1887-1985): Hour between Wolf and Dog (Between Darkness and Light), 1938-1943. Oil on canvas, 100 x 73 cm. Private Collection. © This artwork may be protected by copyright. It is posted on the site in accordance with fair use principles. 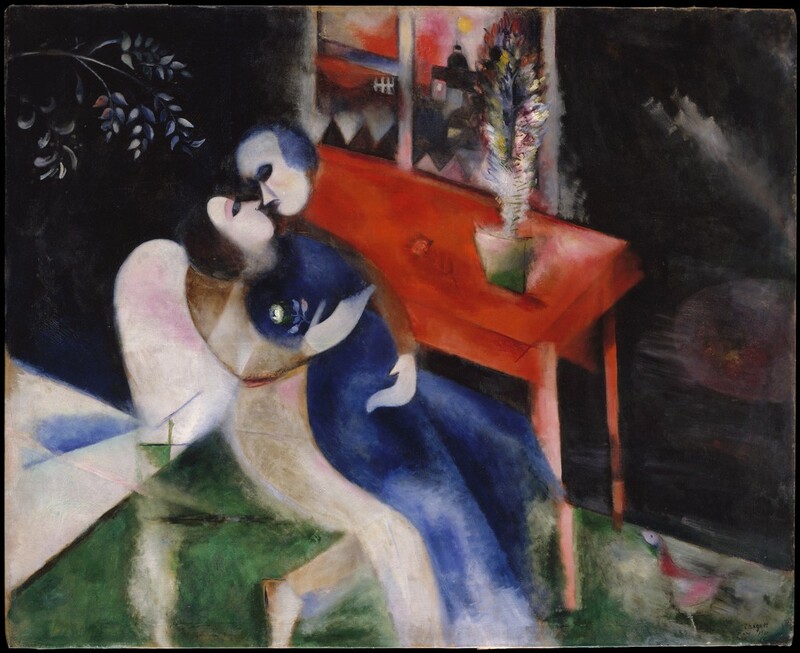 Marc Chagall (French, born Russia — present-day Belarus; 1887-1985): The Lovers, 1913-1914. Oil on canvas, 43 x 53 inches (109.2 x 134.6 cm). Metropolitan Museum of Art, New York, NY, USA. © Artists Rights Society (ARS), New York. © This artwork may be protected by copyright. It is posted on the site in accordance with fair use principles. 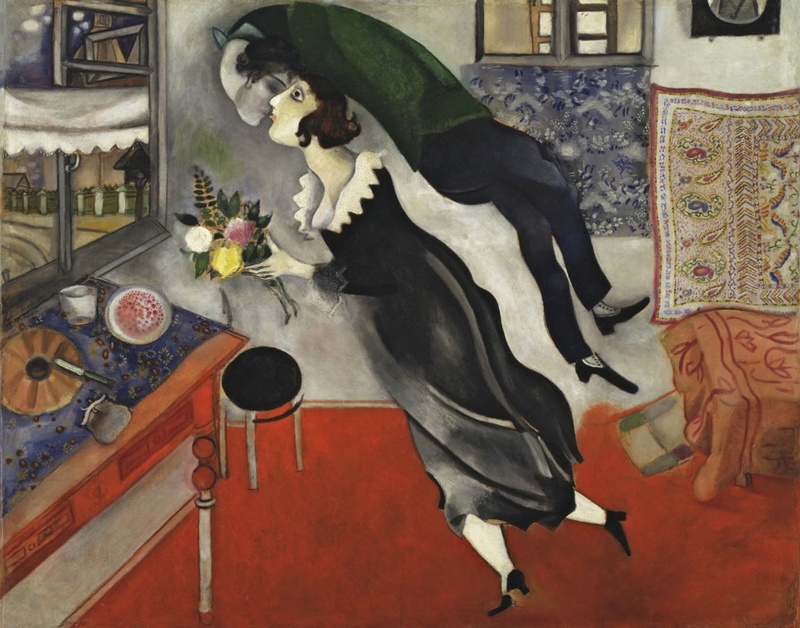 Marc Chagall (French, born Russia — present-day Belarus; 1887-1985): Grey Lovers, 1917. Oil on canvas, 69 x 49 cm. Private Collection. © This artwork may be protected by copyright. It is posted on the site in accordance with fair use principles. 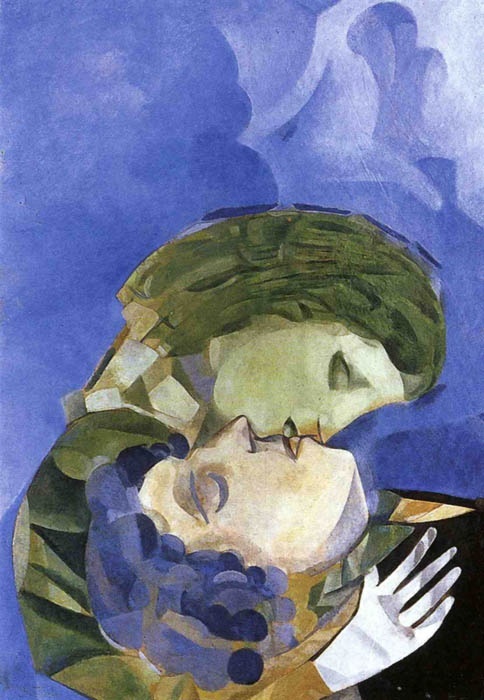 Marc Chagall (French, born Russia — present-day Belarus; 1887-1985): Pair of lovers, 1916. Oil on board, 70.7 x 50 cm. Private Collection. © This artwork may be protected by copyright. It is posted on the site in accordance with fair use principles. 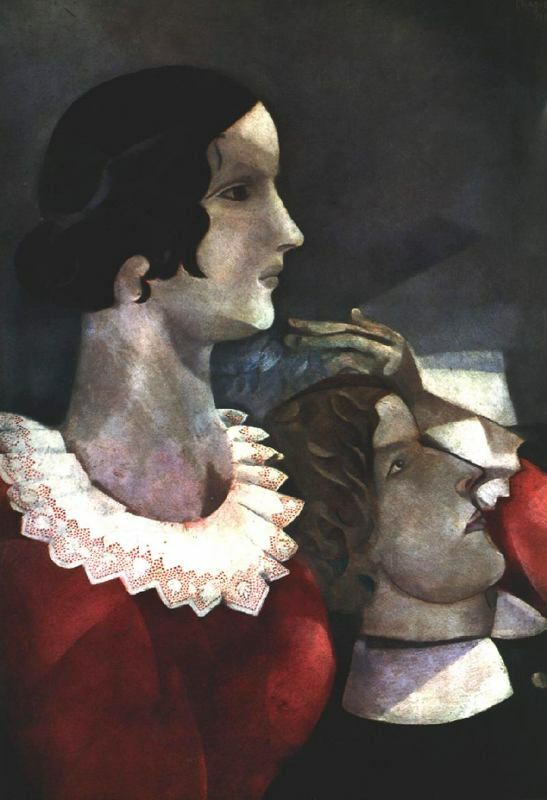 Marc Chagall (French, born Russia — present-day Belarus; 1887-1985): Birthday, 1915. Oil on cardboard, 31-3/4 x 39-1/4 inches (80.6 x 99.7 cm). The Museum of Modern Art, New York, NY, USA. Image: © The Museum of Modern Art © Artists Rights Society (ARS), New York / ADAGP, Paris © This artwork may be protected by copyright. It is posted on the site in accordance with fair use principles. 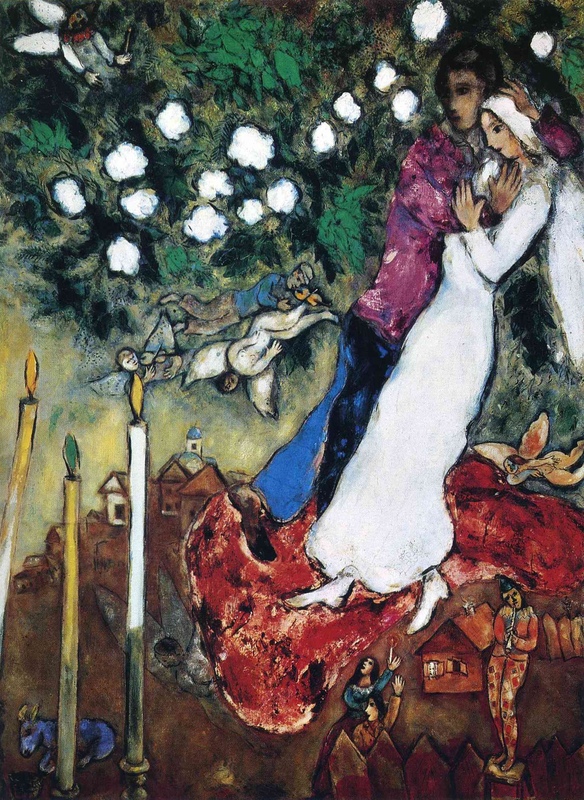 Marc Chagall (French, born Russia — present-day Belarus; 1887-1985): The Three Candles, 1938-1940. Oil on canvas, 127.5 x 96.5 cm. Private Collection. © This artwork may be protected by copyright. It is posted on the site in accordance with fair use principles. 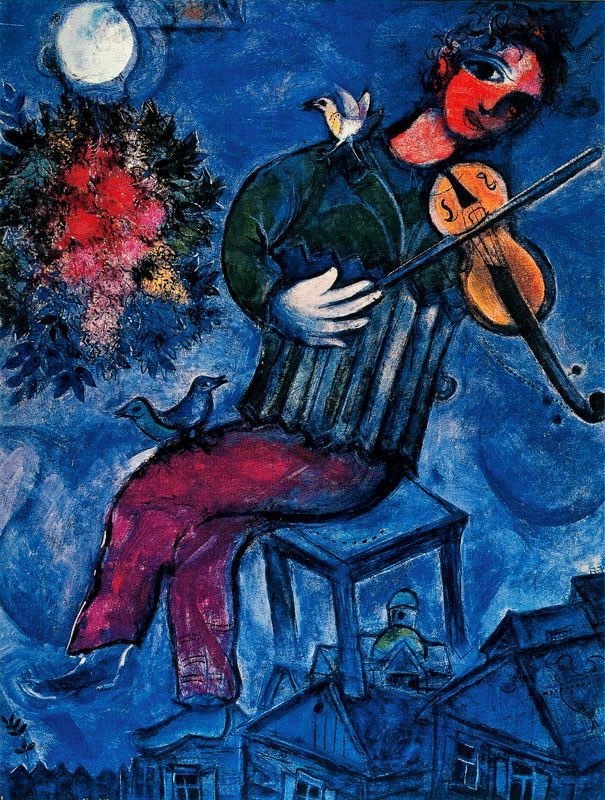 Marc Chagall (French, born Russia — present-day Belarus; 1887-1985): The Blue Fiddler, 1947. © This artwork may be protected by copyright. It is posted on the site in accordance with fair use principles. 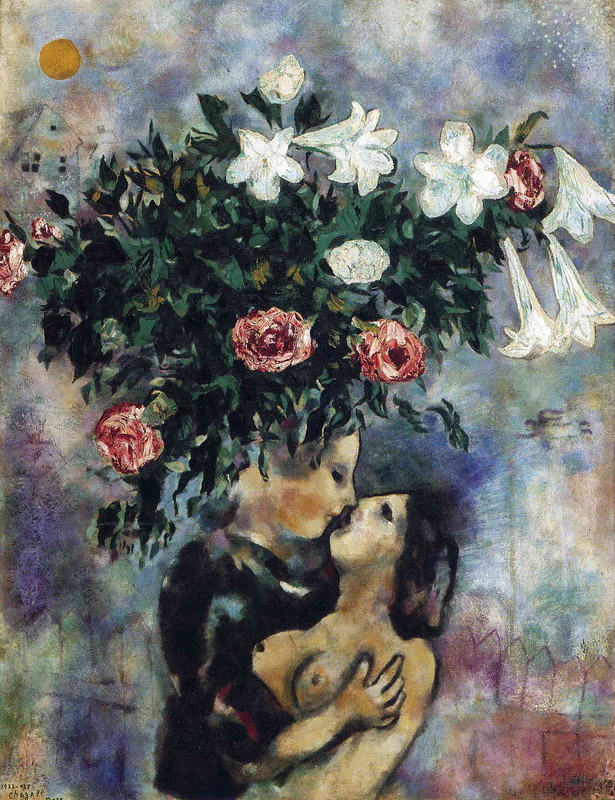 Marc Chagall (French, born Russia — present-day Belarus; 1887-1985): Lovers under Lilies, 1925. Oil on canvas. Private Collection. © This artwork may be protected by copyright. It is posted on the site in accordance with fair use principles. 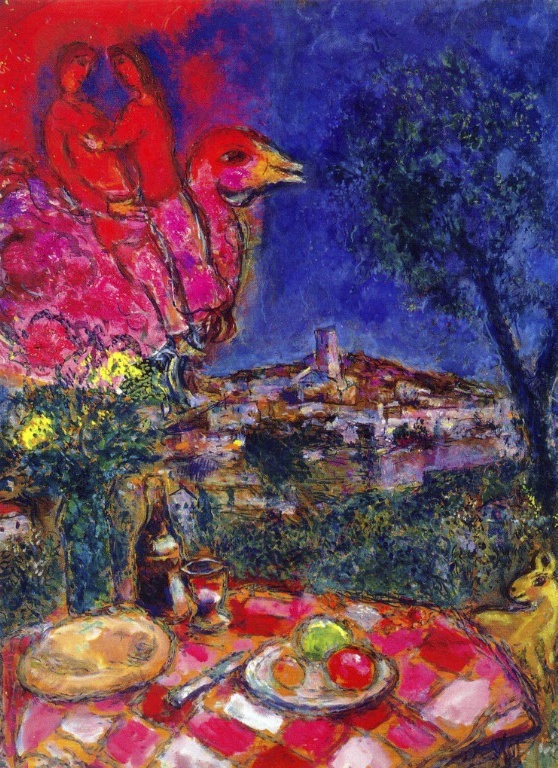 Marc Chagall (French, born Russia — present-day Belarus; 1887-1985): Laid Table with View of Saint-Paul de Vence, 1968. Oil on canvas, 100 x 73 cm. Private Collection. © This artwork may be protected by copyright. It is posted on the site in accordance with fair use principles. 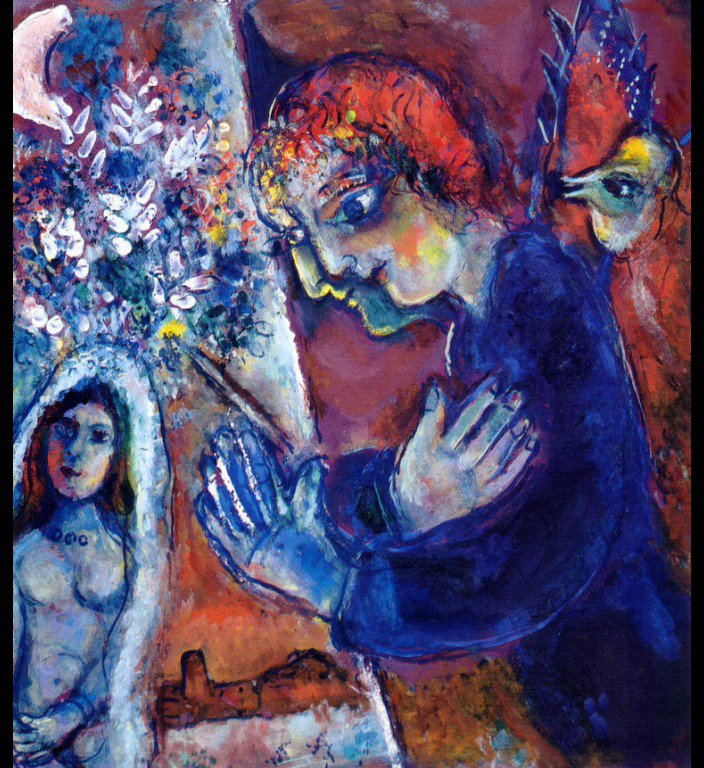 Marc Chagall (French, born Russia — present-day Belarus; 1887-1985): Song of Songs IV (Le Cantique des Cantiques IV), 1958. Oil on canvas, 50 x 61 cm. 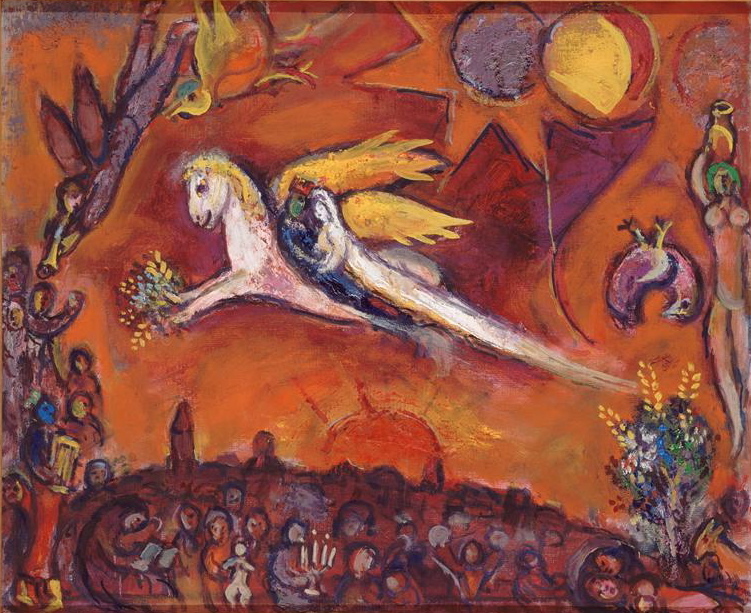 Musée National Message Biblique Marc Chagall, Nice, France. © Artists Rights Society (ARS), New York / ADAGP, Paris © This artwork may be protected by copyright. It is posted on the site in accordance with fair use principles. 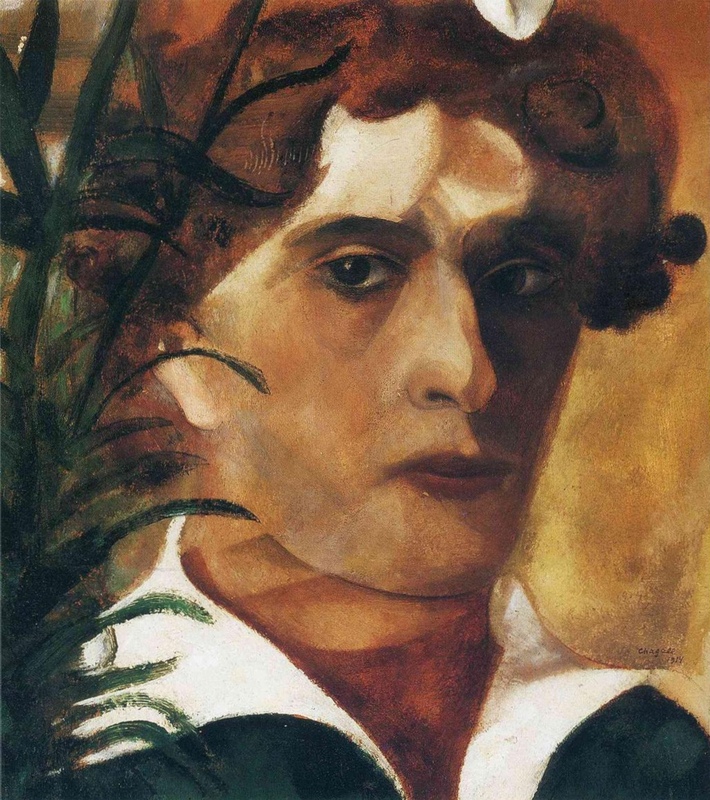 Marc Chagall (French, born Russia — present-day Belarus; 1887-1985): Self-Portrait, 1914. Oil on paper, 30 x 26.5 cm. Philadelphia Museum of Art, Philadelphia, Pennsylvania, USA. © This artwork may be protected by copyright. It is posted on the site in accordance with fair use principles. 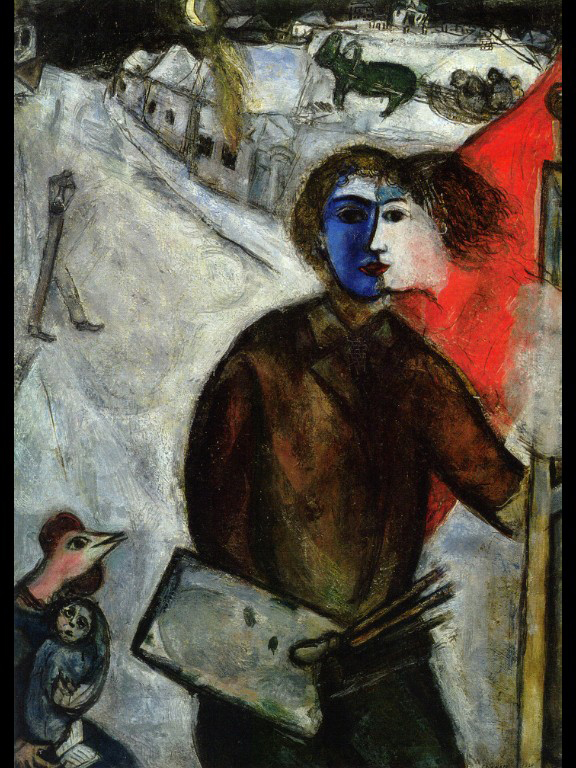 Marc Chagall (French, born Russia — present-day Belarus; 1887-1985): Artist at Easel, c. 1965. Oil on canvas, 55.5 x 49 cm. Private Collection. © This artwork may be protected by copyright. It is posted on the site in accordance with fair use principles. The participation of Japan in the 1862 World Fair in London is notable as a benchmark in the fin de siècle explosion of Japanese culture on the world scene. A growing tremendous popularity — and influence — of Japanese culture accompanied the opening of trade with the formerly closed Japanese society in the years leading up to the World Fair. Contemporary European artists reflected this general cultural interest with a strong interest in Japanese art. James Abbott Whistler was among the first to reflect this in his artwork, to be joined by the Impressionists and Post Impressionists. Degas, Mary Cassatt, Vincent van Gogh and Gauguin quickly come to mind. Both Gauguin and Vincent van Gogh included depictions of Ukiyo-e woodblock prints in various of their artworks. 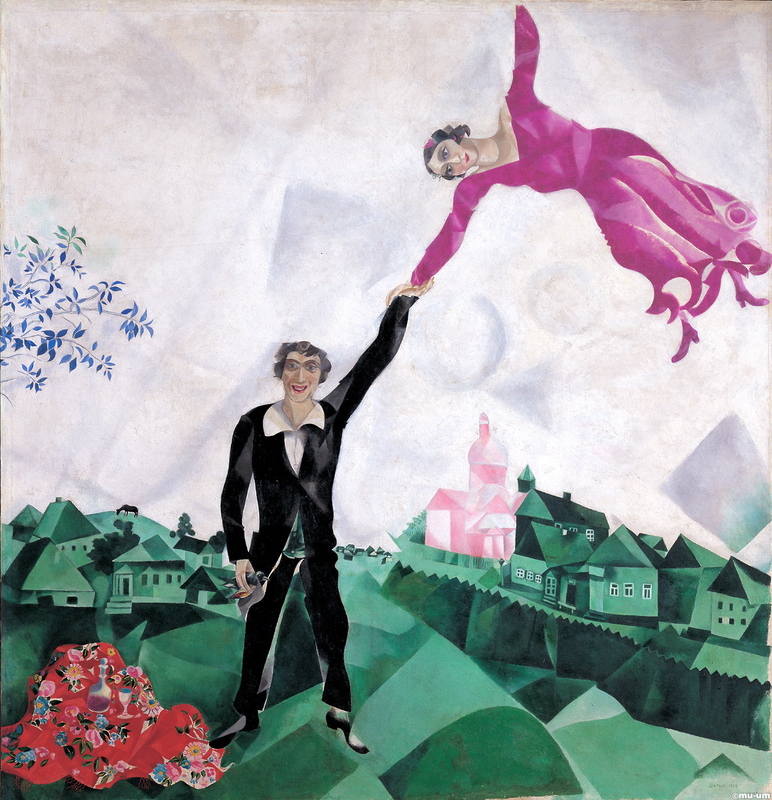 This direct and pervasive influence upon European artists will be explored in later blogs. Particularly popular were the Ukiyo-e (pictures of the floating world) colored woodblock prints. Ukiyo (floating world) subject matter originally focused upon the Edo (now Tokyo) urban red-light district culture of geisha, samurai, kabuki actors, brothels, sumo wrestlers and the like, with an emphasis upon the pleasure-seeking nature of the activities. 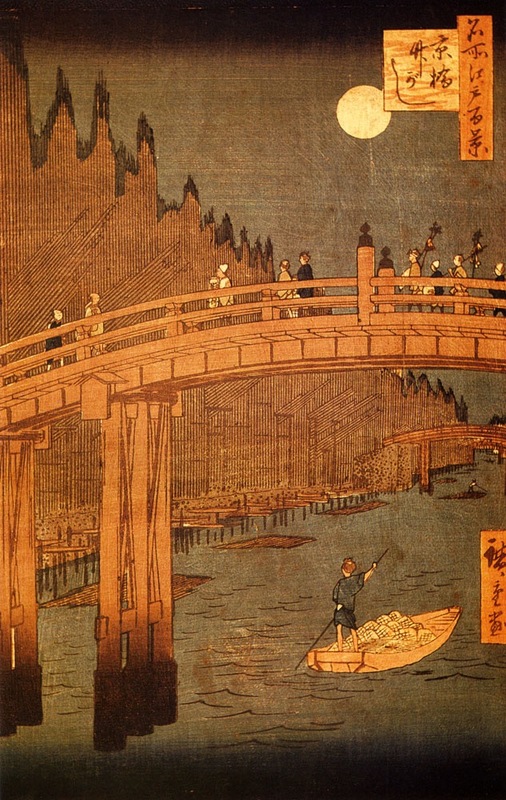 An interesting enrichment of meaning, that for those familiar with the Japanese language would be instantly understood, is that the homophone of the word Ukiyo means “sorrowful world.” So, intimately connected to the visual experience of the depictions of life’s pleasures, was perhaps suggested the poignance of the fleeting or illicit nature of those pleasures. The great Katsushika Hokusai (1760-1849) expanded the floating world subject matter by introducing landscapes and scenes of everyday Japanese life as subject matter. Hokusai’s unrivaled masterpiece, The Great Wave off Kanagawa, c. 1830, 1831, from the series Thirty-six views of Mount Fuji can be viewed at the current LACMA exhibition: Japanese Paintings and Prints: Celebrating LACMA’s 50th Anniversary. These powerful works inspect life at every level, from the humble to the epic and in doing so remain as compelling today as ever. 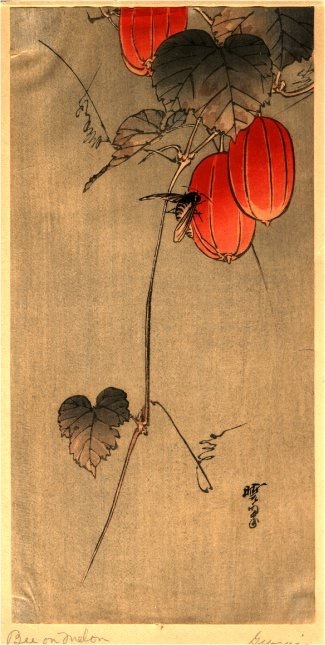 Kawanabe Kyōsai (aka, Kawanabe Gyosai) (Japanese, 1831–1889): Bee on Melon. 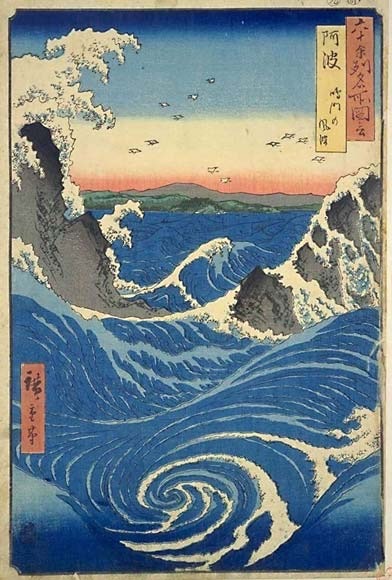 Utagawa Hiroshige (Ando) (Japanese; Ukiyo-e, Edo period; 1797-1858): Naruto Whirlpool, Awa Province; c. 1853. From the series: Views of Famous Places in the Sixty-Odd Provinces. Color woodblock print. Utagawa Hiroshige (Ando) (Japanese, Ukiyo-e, 1797-1858): Kyobashi Bridge, 1858. 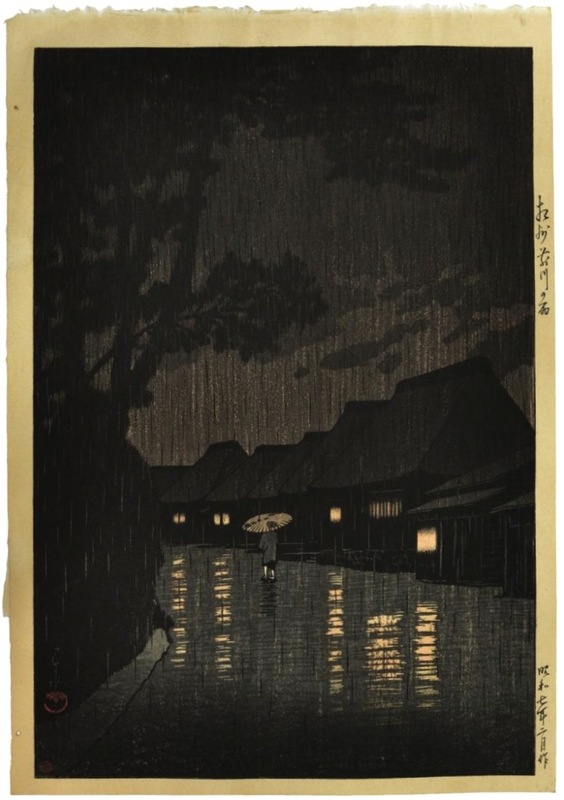 Woodblock color print. 35.3 x 24.1 cm. Private Collection. 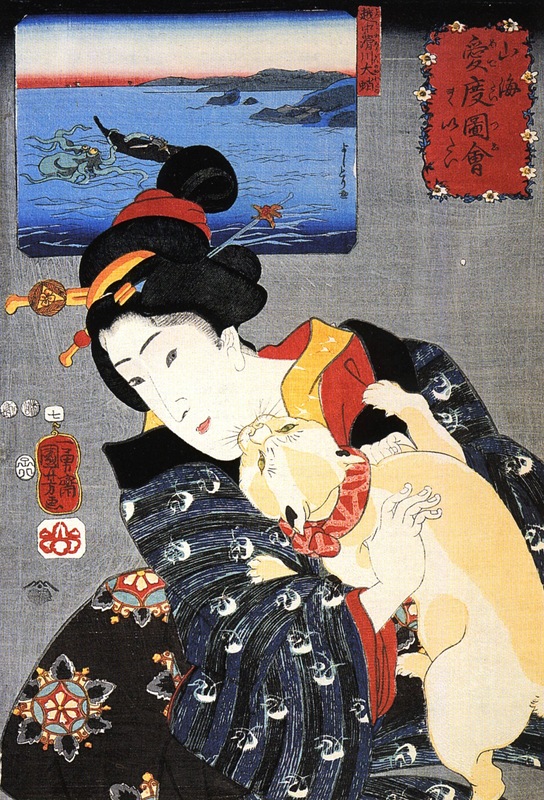 Hokusai, Katsushika (Japanese, Ukiyo-e, 1760-1849): Geisha with Cat, 1852. Kawase Hasui (Japanese, 1883–1957): Shower at Lake Shore (Matsue) [Chihan no ame (Matsue)], dated: February 1932 (Showa 7.2). 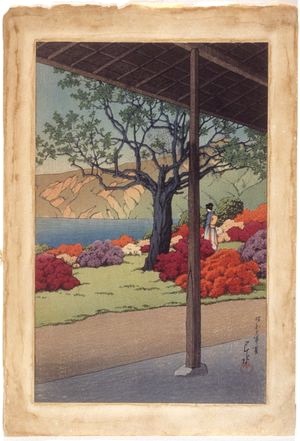 Color woodblock print with Circular Watanabe publisher seal, later impression, somewhat toned; overall 15.25 x 10.25 inches. Private Collection. 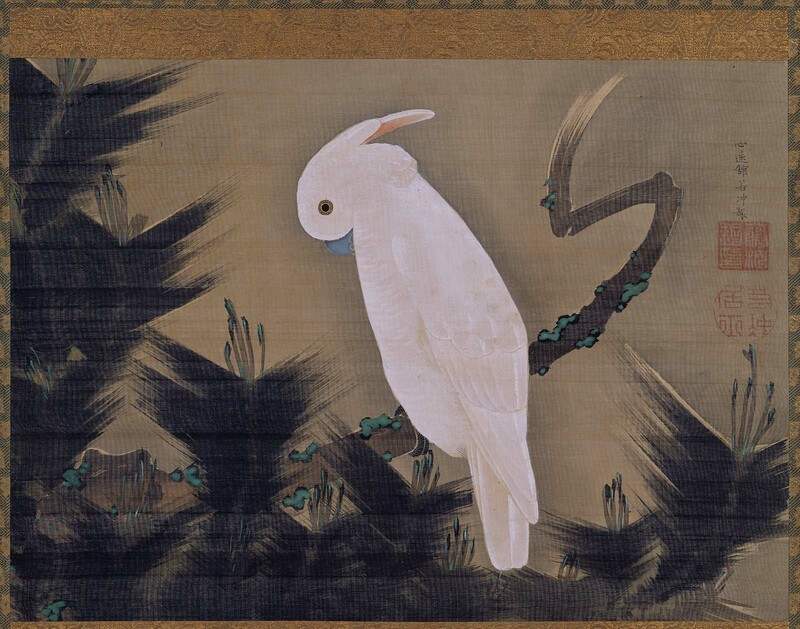 Itô Jakuchû (Japanese, mid-Edo period, 1716–1800): White Cockatoo on a Pine Branch, late 18th century. Hanging scroll; ink and color on silk. Image: 40.1 x 55.6 cm (15-13/16 x 21-7/8 inches) Overall: 138 x 70 cm (54-5/16 x 27-9/16 inches). Museum of Fine Arts, Boston, Massachusetts, USA. Image: © 2015 Museum of Fine Arts, Boston. Kawase Hasui (Japanese, 1883–1957): Azalea Garden, 1935. Color woodblock print, 15.5 x 10.5 inches (sheet). Indianapolis Museum of Art, Indianapolis, Indiana, USA. 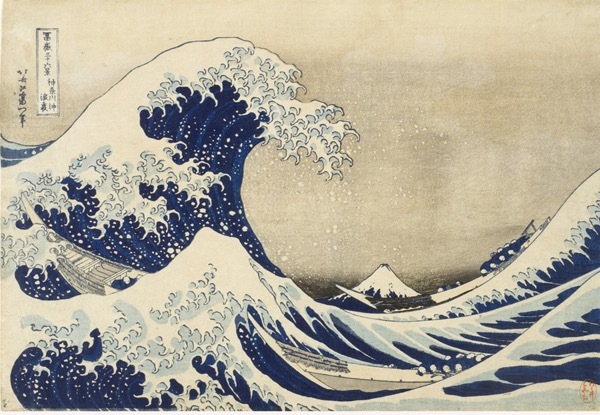 Hokusai, Katsushika (Japanese, Ukiyo-e, 1760-1849): The Great Wave off Kanagawa, c. 1830, 1831. (Series: Thirty-six views of Mount Fuji) Edo period (1615-1868), Color woodblock print. Image: 10-1/4 x 15 inches. Los Angeles County Museum of Art, Los Angeles, California, USA. 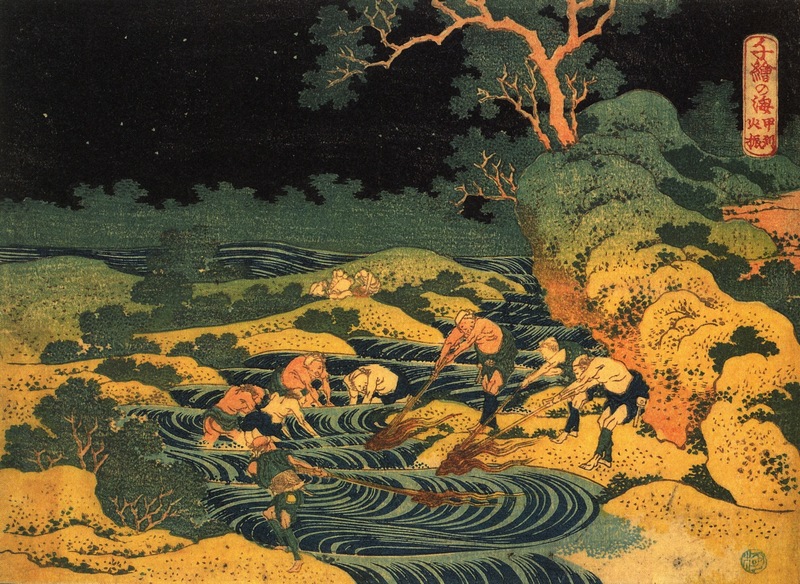 Hokusai, Katsushika (Japanese, Ukiyo-e, 1760-1849): Fishing by Torchlight in Kai Province (Kôshû hiburi), from the series One Thousand Pictures of the Ocean (Chie no umi); c. 1833. Edo Period. Color woodblock print (nishiki-e); ink and color on paper. 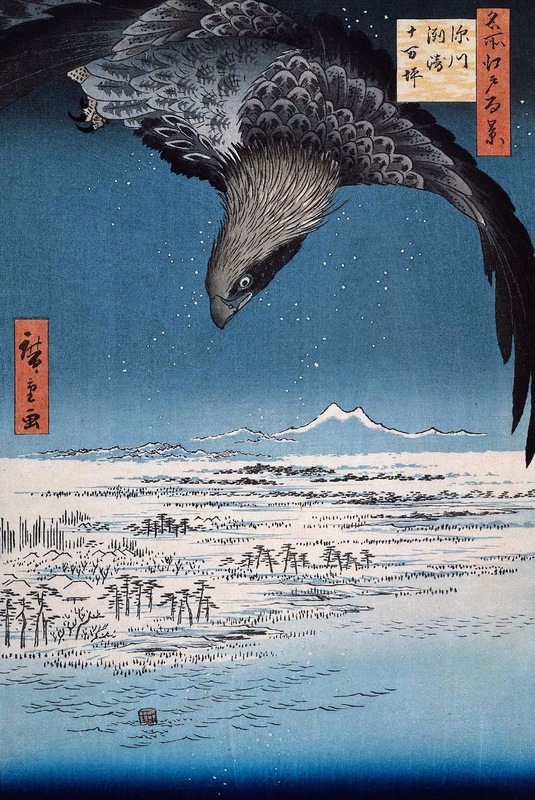 Utagawa Hiroshige (Ando) (Japanese, Ukiyo-e, 1797-1858): Eagle Over 100,000 Acre Plain at Susaki, Fukagawa (Juman-tsubo). Series: 100 Views of Edo (Meisho Edo hyakkei), published by Uoya Eikichi, 1857. Color Woodblock print. Fitzwilliam Museum, University of Cambridge, UK. 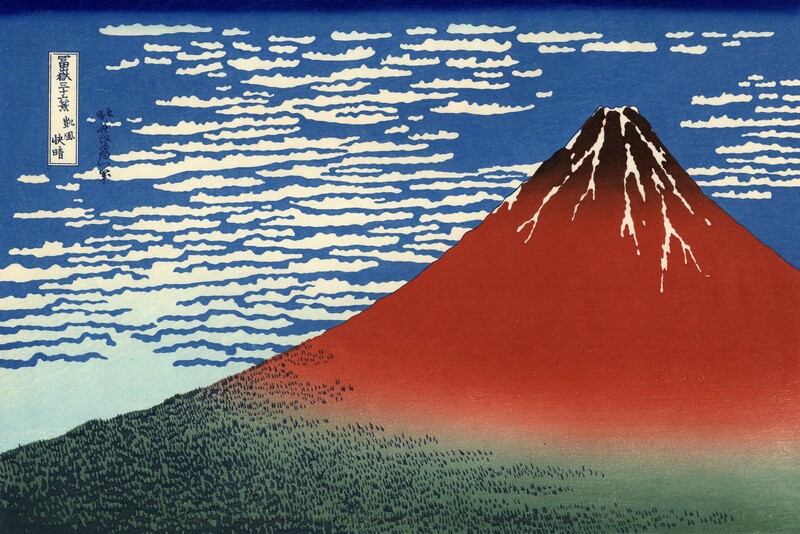 Hokusai, Katsushika (Japanese, Ukiyo-e, 1760-1849): Fuji, Mountains in clear Weather (Red Fuji), 1831. 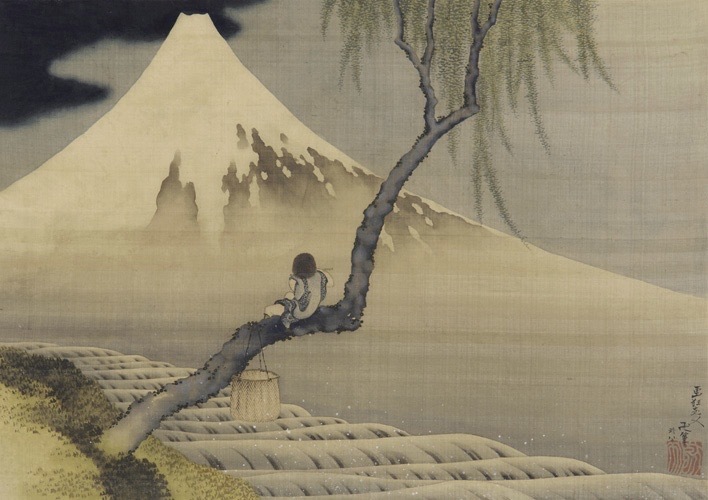 Series: Thirty-six views of Mount Fuji. Color woodblock print. Private Collection. 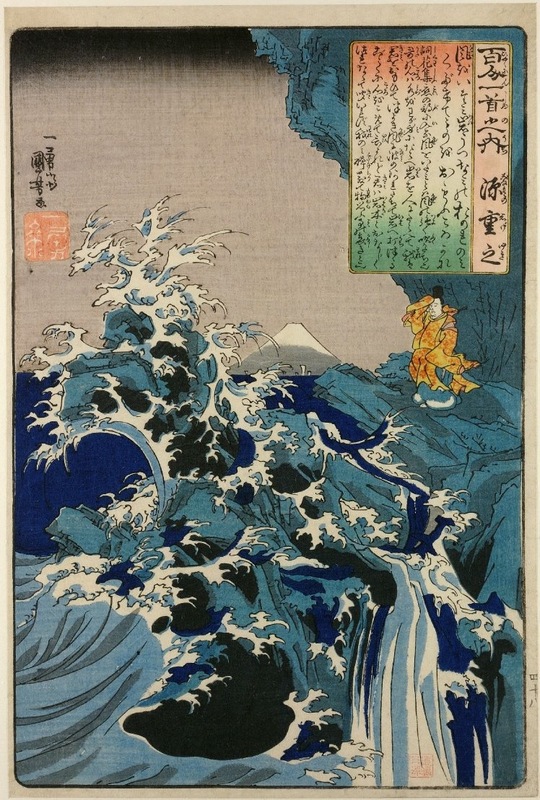 Kuniyoshi, Utagawa (Japanese, Ukiyo-e, 1797–1861): Poet gazing at waves against rocks. Color woodblock print. Classical literature, Poem, Inscription. Poem, No 48 (by Minamoto no Shigeyuki, died 1000) / From the Series: Hyakunin Isshu no uch (One Hundred Poems by One Hundred Poets). British Museum, London, UK. 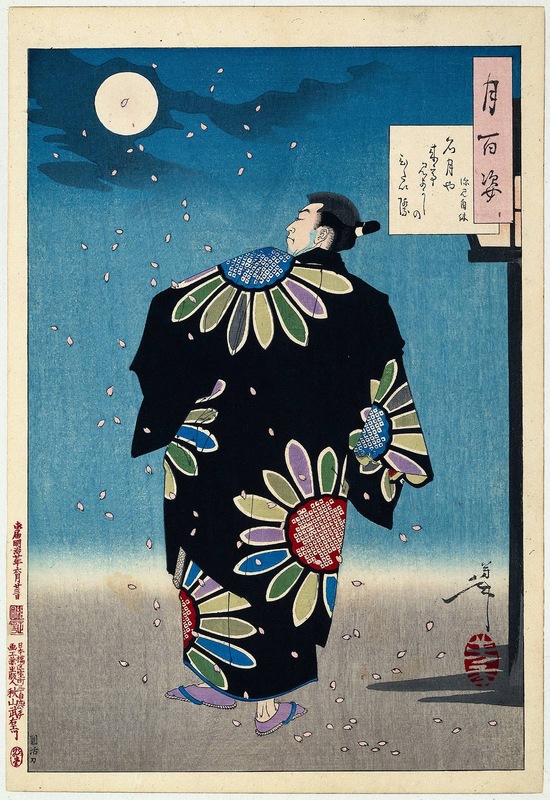 Yoshitoshi, Tsukioka (Japanese, Ukiyo-e, 1839–1892): Fukami Jikyu (The full moon coming with a challenge to flaunt its beautiful brow-Fukami Jikyu), Series: One Hundred Aspects of the Moon, 1887. Colored ink on paper, woodcut; 35 x 23.4 cm. Rijksmuseum, Amsterdam, Netherlands. 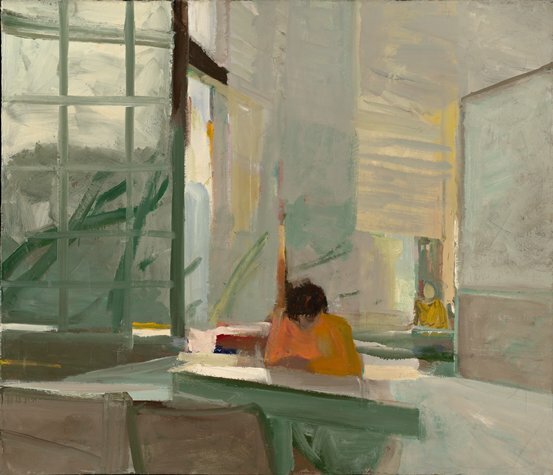 Among the Bay Area figurative painters, the impassioned works of Elmer Bischoff serve as a perfect counterpoint to the cool abstractions of Richard Diebenkorn. Bischoff, a Berkeley native, returned after World War II to the area to paint, to teach and to become one of the most instrumental founding artists of the Bay Area figurative art movement. 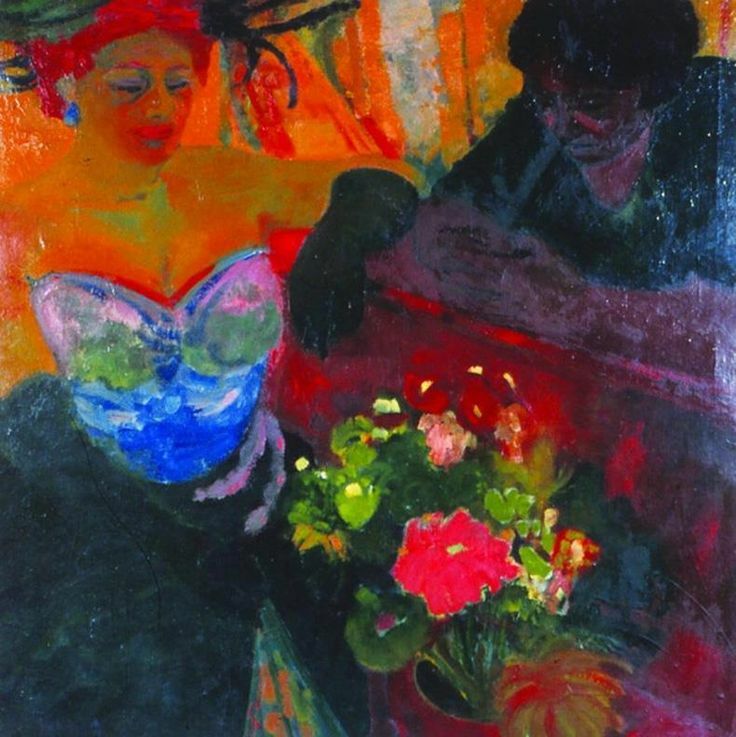 His work stands apart in exceptional color intensity and raw emotional force. From his early foray into Abstract Expressionism, there remains an amazingly loose and fluid gestural brushwork imparting high drama and lyricism to his works. Otherwise quiet subjects bristle and seethe with life through vigorously worked surfaces. Altogether — an intoxicating body of works, varied and captivating — Bischoff always leaves me wanting more. 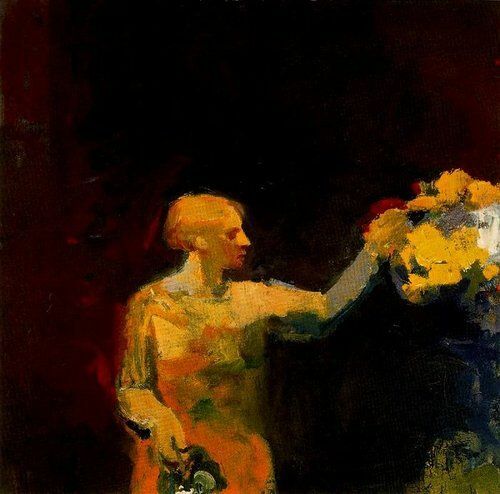 Elmer Bischoff (American, Bay Area Figurative Movement, 1916–1991): Woman with Yellow Flowers, 1958. Oil on canvas, 56 x 56 inches (142.8 x 144.2 cm). © Estate of Elmer Bischoff. © This artwork may be protected by copyright. It is posted on the site in accordance with fair use principles. 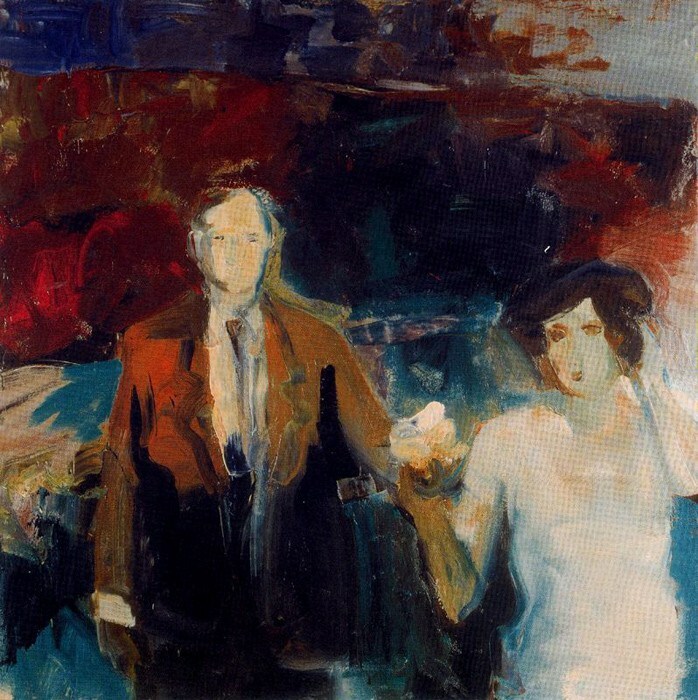 Elmer Bischoff (American, Bay Area Figurative Movement, 1916–1991): Couple, c. 1960. Oil on canvas. © Estate of Elmer Bischoff. © This artwork may be protected by copyright. It is posted on the site in accordance with fair use principles. Elmer Bischoff (American, Bay Area Figurative Movement, 1916–1991): Orange Sweater, 1955. Oil on canvas, 48-1/2 x 57 inches (123.19 x 144.78 cm). San Francisco Museum of Modern Art, San Francisco, California, USA. (Museum closed for expansion through early 2016.) © Estate of Elmer Bischoff © This artwork may be protected by copyright. It is posted on the site in accordance with fair use principles. 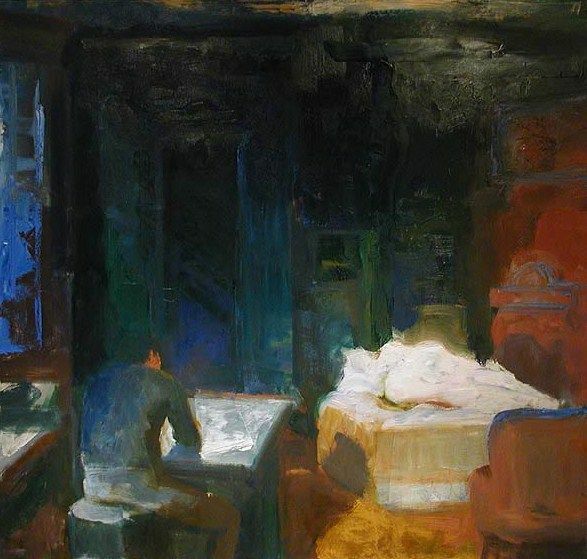 Elmer Bischoff (American, Bay Area Figurative Movement, 1916–1991): Interior with Two Figures, 1965. Oil on canvas, 64 x 67 inches. Private Collection. Image: © Hackett-Freedman Gallery, San Francisco, California, USA. © Estate of Elmer Bischoff. © This artwork may be protected by copyright. It is posted on the site in accordance with fair use principles. 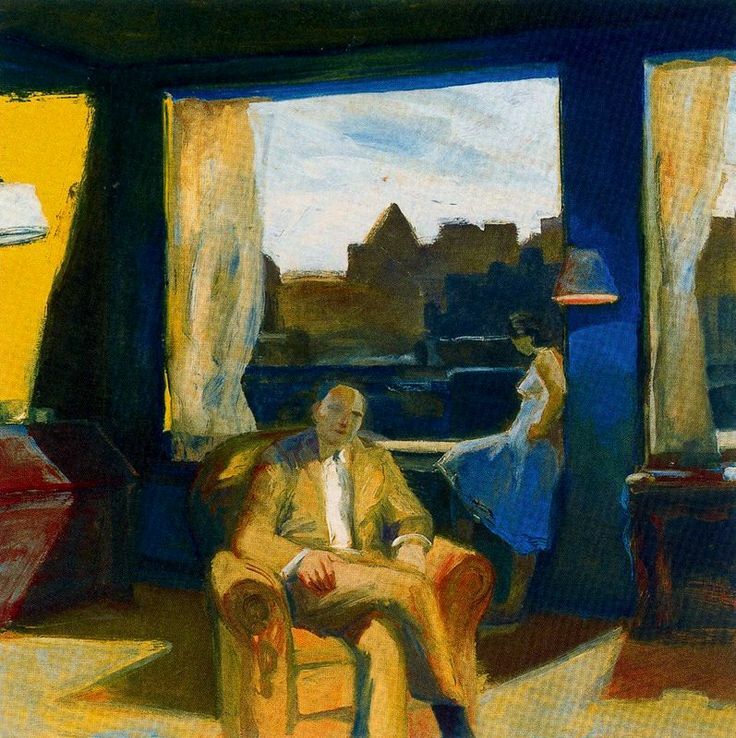 Elmer Bischoff (American, Bay Area Figurative Movement, 1916–1991): Interior with Two Figures, 1968. Oil on canvas, 80 x 80 inches (203.2 x 203.2 cm). The Lobell Family Collection, New York, USA. © Estate of Elmer Bischoff. © This artwork may be protected by copyright. It is posted on the site in accordance with fair use principles. 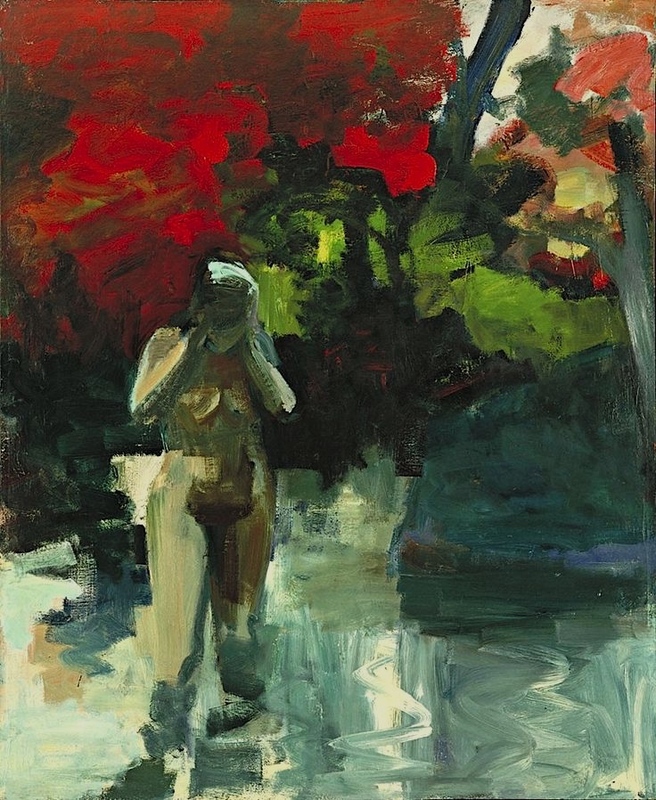 Elmer Bischoff (American, Bay Area Figurative Movement, 1916–1991): Girl Wading, 1959. Oil on canvas, 82-5/8 x 67-3/4 inches (209.8 x 172 cm). Museum of Modern Art, New York, NY, USA. 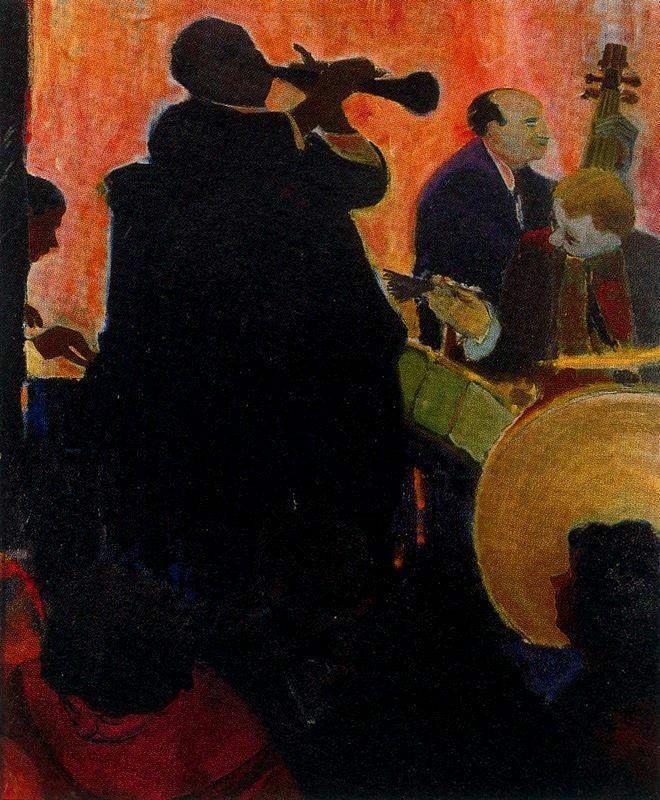 © Estate of Elmer Bischoff. © This artwork may be protected by copyright. It is posted on the site in accordance with fair use principles. 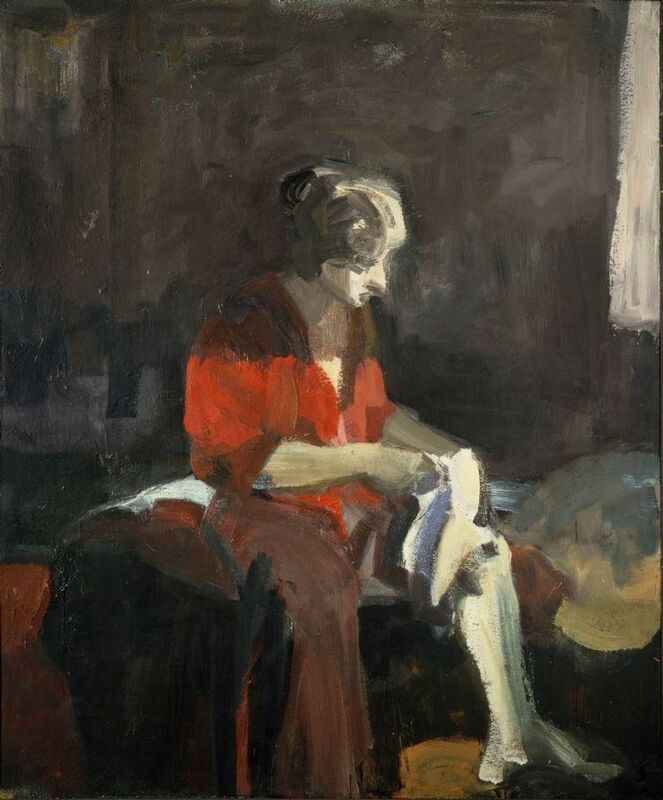 Elmer Bischoff (American, Bay Area Figurative Movement, 1916–1991): Woman Dressing, 1959. Oil on canvas. © Estate of Elmer Bischoff. © This artwork may be protected by copyright. It is posted on the site in accordance with fair use principles. Elmer Bischoff (American, Bay Area Figurative Movement, 1916–1991): Buildings, 1969. Oil on canvas, 20 x 24 inches. (Not on view. Museum closed during their expansion.) © This artwork may be protected by copyright. It is posted on the site in accordance with fair use principles. 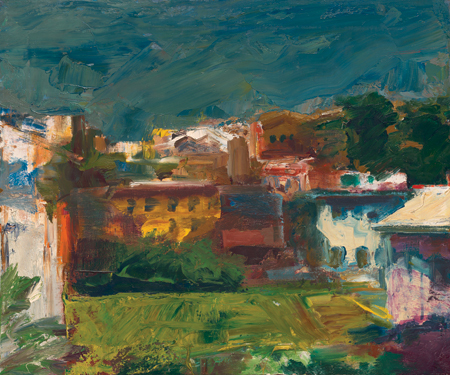 Elmer Bischoff (American, Bay Area Figurative Movement, 1916–1991): Houses and Hills, 1957. Oil on canvas, 76.3 x 66.3 cm. Hirshhorn Museum and Sculpture Garden, Washington D.C., USA. 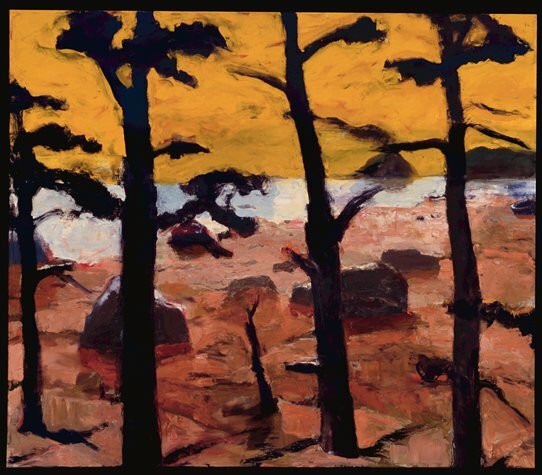 © Estate of Elmer Bischoff. © This artwork may be protected by copyright. It is posted on the site in accordance with fair use principles. Elmer Bischoff (American, Bay Area Figurative Movement, 1916–1991): Late Afternoon, 1953. Oil on canvas, 52 x 56 inches. Private Collection. © Estate of Elmer Bischoff. © This artwork may be protected by copyright. It is posted on the site in accordance with fair use principles. 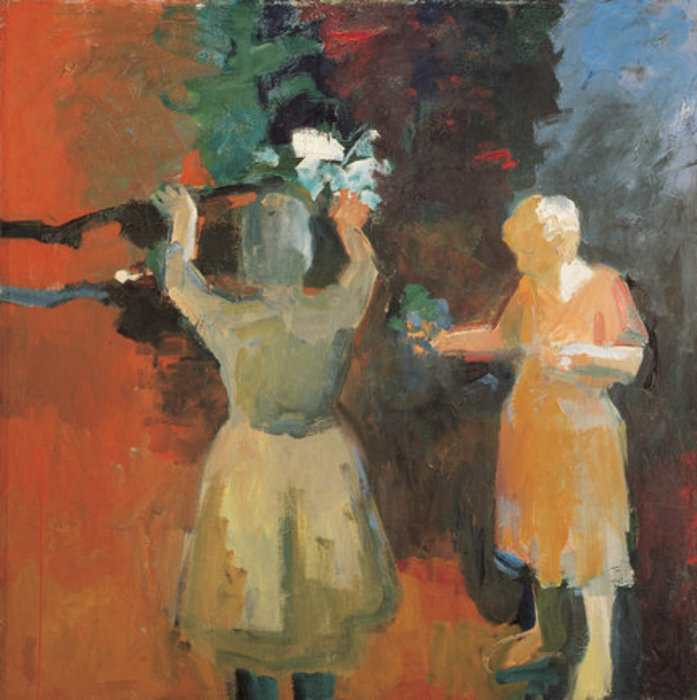 Elmer Bischoff (American, Bay Area Figurative Movement, 1916–1991): Two Women in Vermillion Light, 1959. Oil on canvas, 67-1/2 x 67-1/2 inches. San Jose Museum of Art, San Jose, California, USA. © This artwork may be protected by copyright. It is posted on the site in accordance with fair use principles. 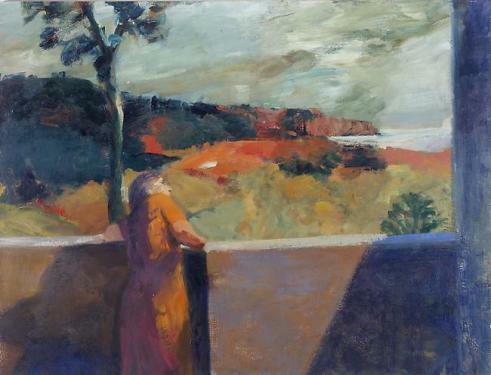 Elmer Bischoff (American, Bay Area Figurative Movement, 1916–1991): Red Cliffs, 1963. Oil on canvas, 78 x 103 inches. John Berggruen Gallery, San Francisco, California, UK. © Estate of Elmer Bischoff © This artwork may be protected by copyright. It is posted on the site in accordance with fair use principles. 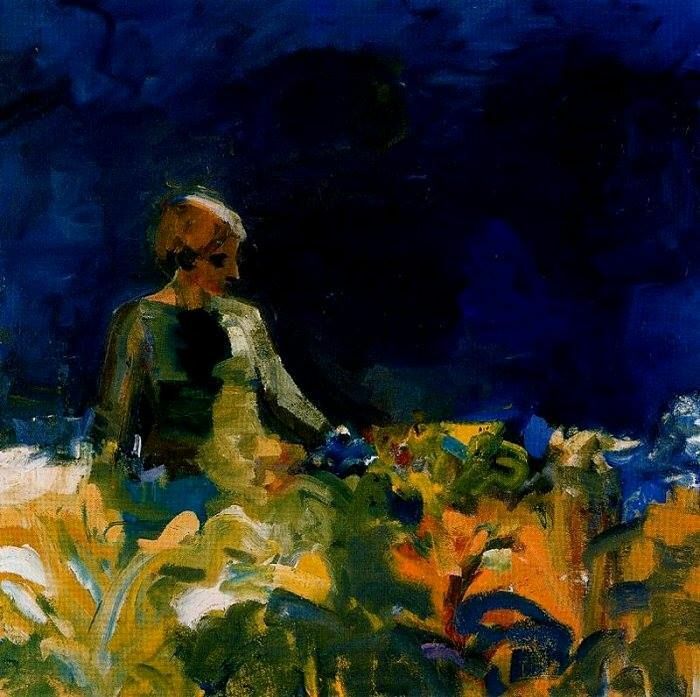 Elmer Bischoff (American, Bay Area Figurative Movement, 1916–1991): Woman with Dark Blue Sky, 1959. Oil on canvas. © Estate of Elmer Bischoff. © This artwork may be protected by copyright. It is posted on the site in accordance with fair use principles. 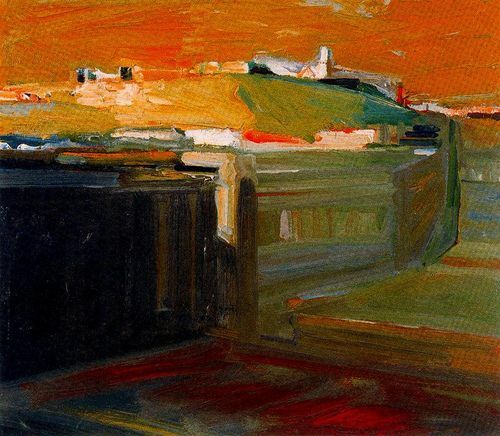 Elmer Bischoff (American, Bay Area Figurative Movement, 1916–1991): Orange Sky, 1958. Oil on canvas. © Estate of Elmer Bischoff. © This artwork may be protected by copyright. It is posted on the site in accordance with fair use principles. 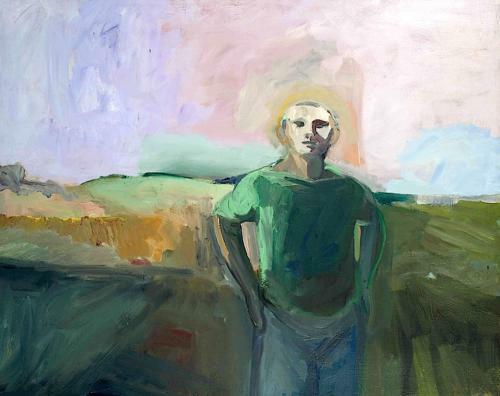 Elmer Bischoff (American, Bay Area Figurative Movement, 1916–1991): Man and Lavender Sky, 1958. Oil on canvas, 120.6 x 151.7 cm (47.5 x 59.7 inches). Private Collection. © Estate of Elmer Bischoff. © This artwork may be protected by copyright. It is posted on the site in accordance with fair use principles. 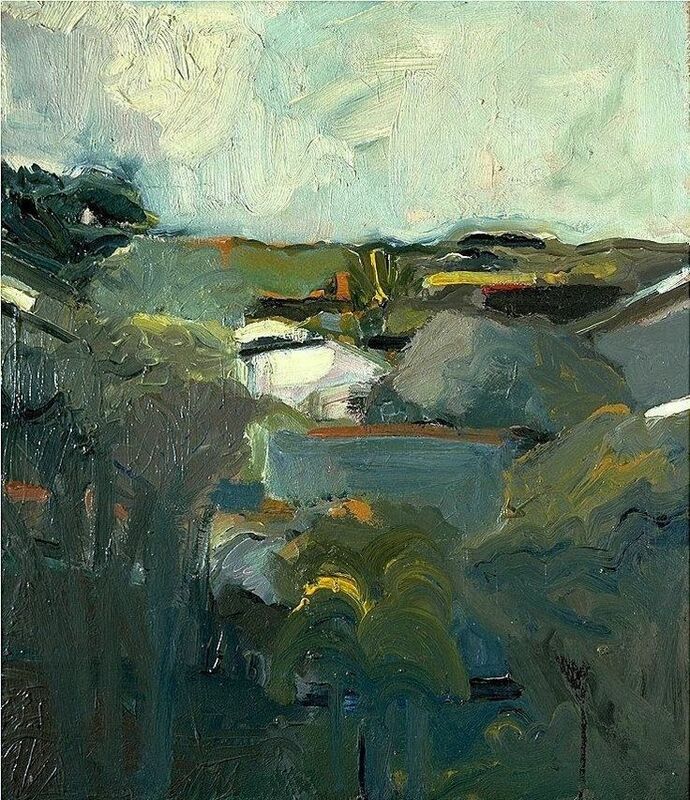 Elmer Bischoff (American, Bay Area Figurative Movement, 1916–1991): Yellow Sky, 1967. Oil on canvas, 79 5/8 x 92 1/8 inches (202.25 x 234 cm). San Francisco Museum of Modern Art, San Francisco, California, USA. © Estate of Elmer Bischoff. © This artwork may be protected by copyright. It is posted on the site in accordance with fair use principles. 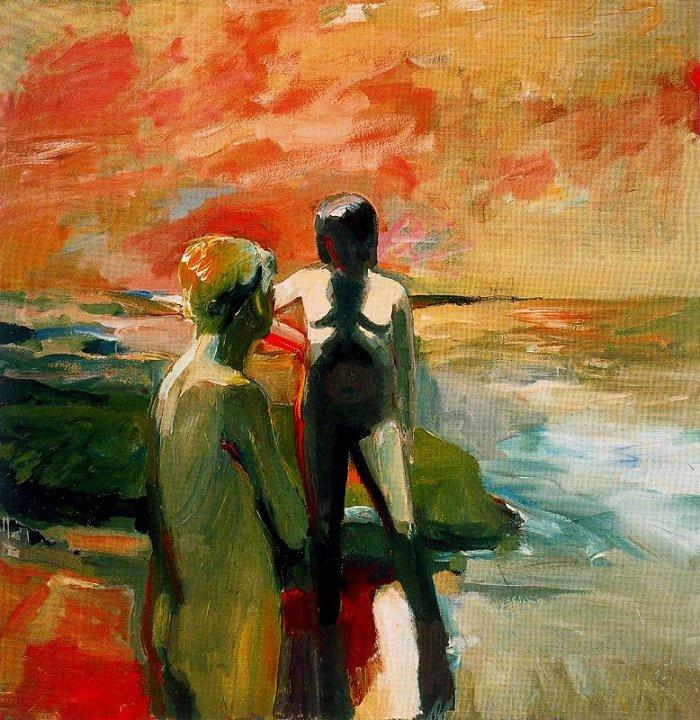 Elmer Bischoff (American, 1916–1991): Two Figures at the Seashore, 1957. Oil on canvas, 57-7/8 x 56-7/8 inches. Orange County Museum of Art, Newport Beach, California, USA. © Estate of Elmer Bischoff. © This artwork may be protected by copyright. It is posted on the site in accordance with fair use principles. 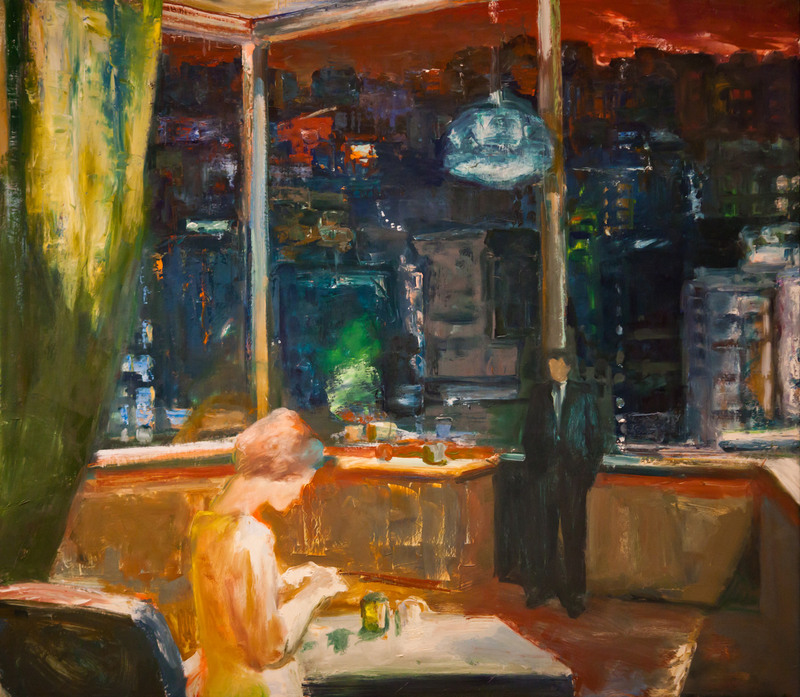 Elmer Bischoff (American, Bay Area Figurative Movement, 1916–1991): Interior with Cityscape, 1969. Oil on canvas. Cantor Arts Center, Stanford University, Stanford, California, USA. © Estate of Elmer Bischoff. © This artwork may be protected by copyright. It is posted on the site in accordance with fair use principles. 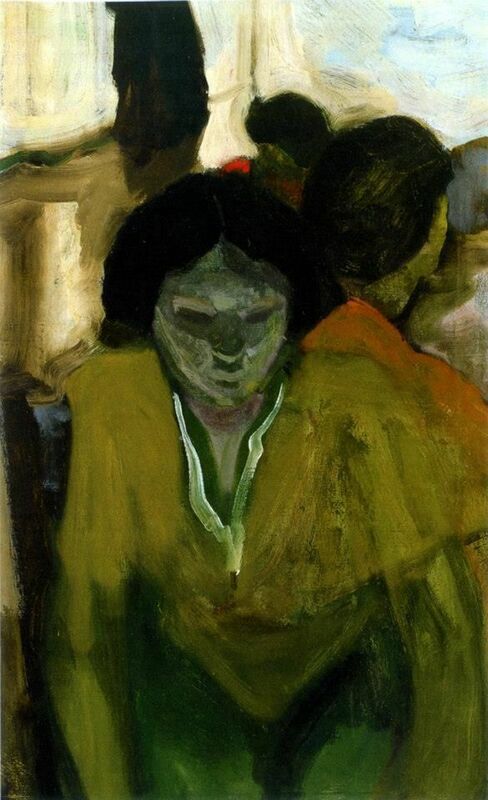 Elmer Bischoff (American, Bay Area Figurative Movement, 1916–1991): Unknown Title. © Estate of Elmer Bischoff. © This artwork may be protected by copyright. It is posted on the site in accordance with fair use principles. Elmer Bischoff (American, Bay Area Figurative Movement, 1916–1991): Unknown Title. Oil on canvas. © Estate of Elmer Bischoff. © This artwork may be protected by copyright. It is posted on the site in accordance with fair use principles. 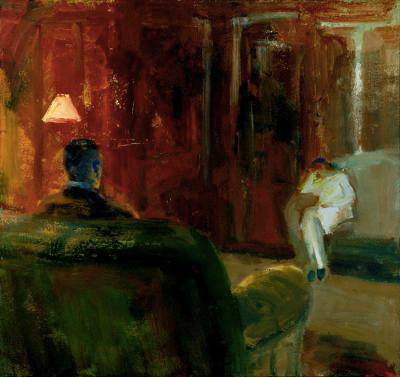 Elmer Bischoff (American, Bay Area Figurative Movement, 1916–1991): Red Fireplace, 1970. Oil on canvas. © Estate of Elmer Bischoff. © This artwork may be protected by copyright. It is posted on the site in accordance with fair use principles.